Super Latok is an extremely tough and surprisingly warm mountaineering boot with an unsurpassed reputation for reliability. No wonder then that Super Latok is the preferred choice of many professional high altitude guiding companies around the globe. An extremely well proven and popular choice for winter alpine mountaineering and 6000m trekking peaks. UPPERS: One piece premium quality waterproof and reinforced 2.8 mm. Split leather and Teramida. Three piece adjustable Strap Tongue System (STS). Anatomic padding system for superb comfort and perfect fit. LINING: Boreal Dry-Line® forabsolute waterproofness and superior breathability. Full internal triplelayer Thinsulate® lining for thermal protection. 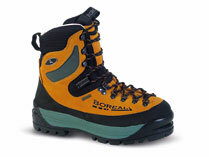 MIDSOLE: Boreal PBG-680 with lateral reinforcements for torsion control. Unique triple layer Thinsulate® thermal protection. SOLE: Boreal Mount FDS-3 with triple density rubber Plus 10 mm. EVA-Promidsole for shock absorption and thermal insulation. Technical Crampon compatible. USAGE: Very cold conditions. Himalayan and alpine climbing. Technical ice and mixed climbing. The upper of Super Latok is primarily made from one-piece of premium quality 2.8mm split leather providing the superb durability of traditional leather that’s hard to beat. Inside you’ll find a fully adjustable 3-piece tongue system for enhanced comfort and support. Unlike other boots in this class Super Latok is generously insulated with a triple thickness Thinsulate lining which surrounds the whole foot - even underneath, making it much warmer than similar looking boots from other brands. Boreal’s unique Dry-Line® waterproof breathable lining guarantees to keep your feet dry and has superior water vapour transmission performance . Super Latok is fully compatible with automatic step-in style crampons and uses Boreal’s unique triple density co-moulded FDS-3 sole unit with class leading grip and reliability. Super Latok Wmns is an extremely tough and surprisingly warm mountaineering boot with an unsurpassed reputation for reliability. No wonder then that Super Latok is the preferred choice of many professional high altitude guiding companies around the globe. 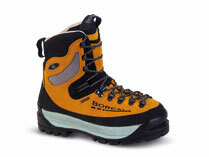 An extremely well proven and popular choice for winter alpine mountaineering and 6000m trekking peaks. Maipo is built to last. The upper is made from thick premium quality split leather upper and has a very generous full length protective rubber rand making it extremely tough and durable. Combined with our unique co-moulded FDS-3 outsole Maipo is built to last and is understandably very popular with mountain professionals.